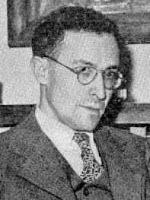 Anthony Edward Santasiere was a strong American chess master, born December 9, 1904. He was US Open Champion in 1945 and three times New York State Champion. Along his career, he beat strong opponents such as Frank Marshall (1931), Arthur Bisguier (1945), Robert Byrne (1946), Larry Evans (1946), Italian Enrico Paoli (1953) and even young Bobby Fischer (1957 – with whom he got a score of 1.5-0.5). Santasiere is best known for the Opening 'Santasiere's Folly' 1.Nf3 followed by 2.b4, but he contributed to chess theory with some others peculiar ideas. 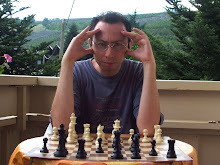 You cand find a short biografy of him at http://en.wikipedia.org/wiki/Anthony_Santasiere and a good collection of his games at http://www.chessgames.com/player/anthony_santasiere.html. When I was a fighting candidate master I’ve often played the b4 Wing gambit to face Sicilian defence. I found out Santasiere’s idea of putting up a strong pawn center with 3.c4 (after 1.e4 c5 2. b4 cxb4) in a book printed in 1985: “Sicilian defence – Wing gambits” by Thomas Kapitaniak. There was less than half a page dedicated to this line, but it attracted me a lot. Also possible is 3…bxc3 4.Nc3 e5 5.f4 d6 6.d4 exd4 7.Qxd4 Nc6 8.Bb5 Bd7 with an unclear game. 7…Nb8 is worse, for example 8.Be2 Na6 9.Nxe5 Bxe2 10.Qa4+ and White stands better. with a position full of tactical possibilities. A. E. Santasiere gives a lot of interesting ideas on this variation, but without serious practical game experience it is very difficult to definitely evaluate this variation”. Santasiere analized this variation in a period where computers didn’t even exist and Fritz was just a (German) name. He concentrated his attention on 3.c4 bxc3 4.Nc3 e5 5.f4, a Wing-King gambit which, in his analysis, gives a very good compensation for White. Unfortunately Black has a more promising defence then 3…bxc3/4…e5 and can also play 6…exd4 in the main line reported above, as in Hector-Kudrin, Baleares open 1989, the only game I know in which two GMs have met on this ground. My personal experience with “Santasiere gambit” is not so good. I’ve won some games, I’ve lost some others, but I’ve almost never obtained a good compensation after the opening. Playing a tournament in Lecco twelve years ago, I won with Black against Alberto Miatello, who is now a candidate master. After the game Alberto told me: “What a pity! I had a surprise for you, but I played with the wrong pieces!”. He knew I would have played 2.b4 Wing gambit and then 3.c4 against Sicilian and he was prepared for it. After 1.e4 c5 2.b4 cxb4 3.c4 e5 4.Nf3 Nc6 5.Bb2 he had planned 5…Bc5 6.Nxe5 Qf6. This is not a new idea: Santasiere himself gives a quick look to it in his analysis. Unfortunately the American master doesn’t evaluate it correctly: after 7.d4 Black is all but forced to playing 7…Bxd4. The strongest move is 7…Nxe5, after which White has a forced variation: 8.dxc5 (8.dxe5 Qxf2#) 8…Nf3+ 9.gxf3 Qxb3 10.Nd2. Ok, White is not losing and the position is about equal. But nobody plays a gambit to reach such a position. That’s why I’ve soon left this variation and tried another line: 3.d4 with the idea 3…d5 4.exd5 Qxd5 5.c4 bxc3 6.Nxc3, gaining a tempo for developing pieces. I only play blitz games on the web nowadays and I’ve sometimes employed the “old Santasiere”; after losing too many games against less rated opponents, I’ve tried a new idea, a postponed Santasiere: 1.e4 c5 2.b4 cxb4 3.a3 bxa3 (you can’t obviously play this variation in case of 3…d5 :-( ) 4.c4. I won a (quite) nice 3 minutes game with this opening just a few weeks ago (ok, it is not perfect…) and I report it here, as well as two other wins achieved with Santasiere Wing gambit in 1994 and 1977 (not by me :-) ). Anthony E. Santasiere died January 13, 1977, 30 years ago: this is my little tribute to him. I do like this gambit ~ especially if playing against someone who has a higher rating ~ I remember playing it and destroying a player in the last game of a round robin tournament. he had not lost a game over the three days. he was devastated that a minor player like me could annilate him.